Most flat breads carry with them a long list of social and culinary baggage. Pita, matzo, injera, cassava, rieska: you have to take the bread’s cuisine with you to the table. The pretzel is unique because you can take it wherever you want! It’s a snack food through and through, though its twisted form is steeped in folklore and symbolism. 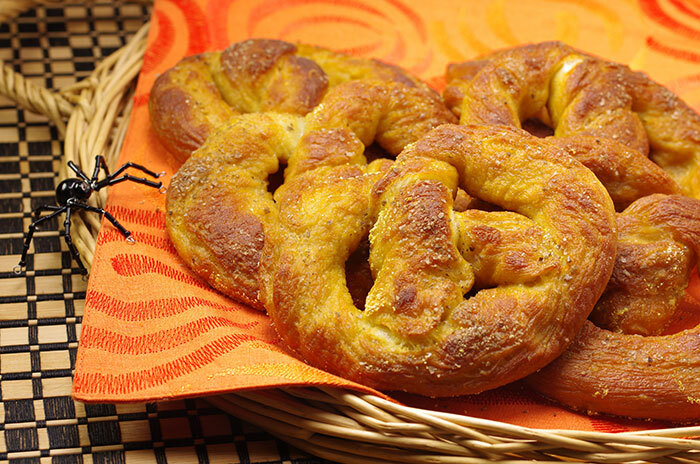 The first pretzels were made in monasteries in the seventh century, and given out on church feast days. The shape is said to represent a child’s arms in prayer. I think a better resemblance is found in the image of two wrestlers drinking beer-which monks also invented. The smoky majesty of Maine hickory smoked salt is a miracle that the monks would surely have prayed for. 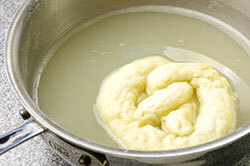 To prepare the pretzel dough, combine the warm water, yeast, and sugar in a large bowl, stirring until mixed. Let sit until foamy, about 5 minutes. 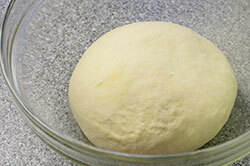 Add 3 tablespoons of the olive oil, the fine traditional salt, and the flour and stir until a kneadable dough forms. 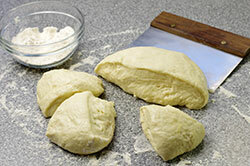 Turn onto a floured surface and knead until the dough is smooth and elastic, about 5 minutes, adding more flour as needed to keep the dough from sticking to your hands or the work surface. Try to add as little flour as possible. 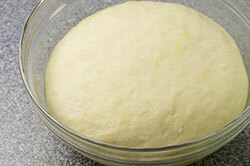 Coat a large bowl with the remaining tablespoon of oil and add the dough, turning to coat it with the oil. Cover and let rise until doubled in bulk, about 1 hour in a warm spot or overnight in the refrigerator. Preheat the oven to 425ºF. 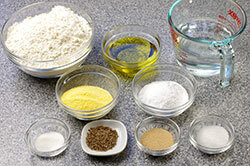 Sprinkle the cornmeal over the bottom of a large rimmed sheet pan; set aside. 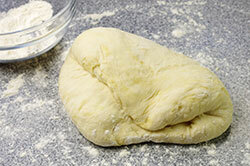 Punch down the dough until most of the air is released, then divide the dough into 6 equal pieces. Lightly flour your hands and a work surface. 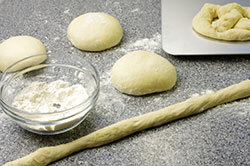 Roll and stretch each piece of dough into a rope about 18 inches long. 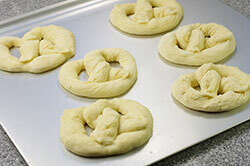 To form a pretzel, lay a dough rope out straight on the floured work surface. Take one end of the rope in each hand. Bring one end of the rope in a loop about 1/2 inch across the center. Bring the other side of the rope across the first side so that it crosses the center of the rope at about the same point and so the overlap is about the same. To form the knot in the center of the pretzel, uncross your hands if you haven’t already and grab the end of the rope closest to each hand. Cross the end of the rope over the top, forming a twist at the center of the pretzel. Push or pull as necessary to even it out and press the ends onto the knot so they stay in place. Bring a quart of water to a boil in a large skillet. Stir in the baking soda and adjust the heat so the water barely simmers. Carefully set a pretzel in the water and simmer until it puffs, about 20 seconds per side. Lift it from the pan with a slotted spoon or spatula, allowing the excess water to drip back into the skillet, and place it on the cornmeal-coated sheet pan. Repeat with the other 5 pretzels. 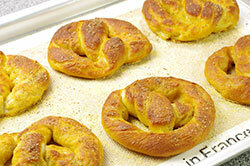 Sprinkle the tops of the pretzels with the smoked salt, and bake until golden brown, 12 to 15 minutes. 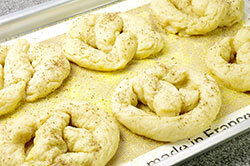 Remove to a cooling rack and let cool for at least 20 minutes, to allow the pretzels to firm up and get a little chewy. Eat within 24 hours.